Preview these works by clicking on the cover images below. Inside the preview, you'll find a link to the book on Amazon.com in the upper, left corner — for purchase. If you prefer to get my works free, sign up for my newsletter in the footer at the bottom of any page on this site. You may be astounded to hear how good the audio system you already have can sound. You’ll enjoy the very best music your Hi-Fi can play when it's set up per audio best practices. 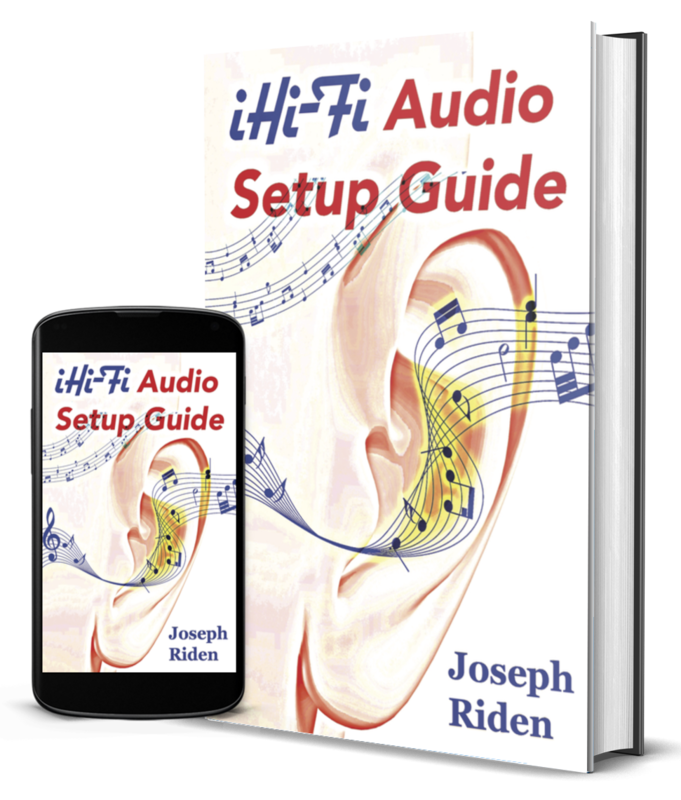 This book covers Hi-Fi system setup and performance tuning extensively, from fundamentals for new enthusiasts, to advanced approaches such as sourcing computer audio, anti-vibration treatment, acoustic room conditioning, and even how audio furniture can help the music you love sound best. All the same principles apply whether you listen to digital files, streaming music, or old-school sources like physical LPs and CDs. True music lovers want their Hi-Fi systems to sound fabulous in their spaces. Yet most home systems never sound the best they could. Learn in detail how to implement superb playback while you also save cash on audio gear. With improved setup, you'll be delighted to demonstrate how great your well-tuned system sounds. Even one tip you learn inside this book could make the cost and reading effort worthwhile. Expect quality and you will not be disappointed. This Kindle e-book is written, designed, and formatted to editorial and production standards for hardbound books produced by major traditional publishers. It's also available as a print paperback Each chapter includes a color illustration. I personally lived a Blimp flight experience. This book tells that story and shares some photos. Hundreds of people, much like you and me, ride Blimps each year. You can't buy a ride from Goodyear® with any amount of money but you can get a ride for free. This book helps you with that. There's a huge interest in Blimps. Many people are "rarin' to go" for a ride. I've identified just what it takes and how to do it. Anyone may get a priceless flight like mine with the right approach, given inside. In this book, you'll learn not only what worked for me but also what works for others who ride the Blimp. You find out the secret of how you can get a ride if you have the gumption. To avoid blind alleys, select your best option and decide how to go about it. Unlike airplanes, Blimps fly low and slowly. You get to look around and take in the scenery rather than zooming past everything. The ride itself is the destination. There's no guarantee, of course, but giving folks rides is what Blimps do when they aren't televising sports events or doing special duty. As the years passed by, I learned to fully appreciate what a unique and memorable experience that ride was. I wish you great success and enjoyment on your own Blimp ride. It's one of the great adventures of a lifetime. How many people do you know who can honestly say they flew in a Blimp? Why not you? The secret awaits within this book. Expect a quality e-book, well-written and well-formatted, and you will not be disappointed. This book is produced following old-fashioned print publishing values, conventions and standards. Seven color images relevant to the content are included. Click to read book, free. When someone searches the Internet for something you offer, will you make a sale? Any seller offering the same thing could get that business. How will you win the ongoing struggle for your customers' eyes, heart, and mind? You need to make your company visible, cast the best light on your offerings, and demonstrate outstanding customer experience. This e-book was written to help you accomplish that, even on a shoestring budget. You can build sales revenues by publishing compelling, magnetic, infectious, and share-worthy content, regardless of your company's size or your offerings' complexity, whatever your customers need and want. The time when a great website was enough is long gone. Today's Internet is an ocean of valuable information mixed with clutter and teeming with competition for attention as it expands exponentially. Yet the web still offers a huge advantage in unprecedented publishing power. To win more sales, publish a quality content stream customers love to consume and share. Assist, inform, educate, or entertain them to gain attention and sales. Even if you're barely computer- and Internet-literate, you can learn to set up an inexpensive but powerful content publishing system. No programming is required. Just configure the right selection of online services, then publish a content stream that merits respect. You'll gain admission to an exclusive group of voices your ideal customers trust, follow, and buy from. Use compelling content to propel leads through your sales process, draw customers back, and stimulate them to refer friends. Content for marketing can be any relevant information that attracts and rewards customers. When it's your stream, you select subject matter your audience prefers. Create an exciting information channel for them. Content brings best results when produced with high production values -- quality white papers, reports, articles, blogs, e-books, e-newsletters, and other formats. So-called "content marketing" is taking our whole business climate by storm because quality content helps customer relationships begin, grow, and endure. Many flourishing companies now routinely drive sales activity with content streams. Worthwhile web content builds customer engagement by providing solid value before, after, and even without sales. It's like publishing your own custom magazine except your private label, branded channels are online and interactive. Marketing with content is less demanding than other alternatives. It takes less cash and a follows a more credible approach than older-style, outbound marketing and sales. Newer inbound methods can be far less expensive than advertising and much more effective than interruption-based selling through cold calls or ads. Just about anyone can market with content online with manageable effort and cost. Content publishing helps professional service firms establish referral-based practices with backlogs. Content helps manufacturing companies generate enough inbound leads to meet strategic goals. Non-profit and political organizations use content to champion their causes at manageable cost. The more complex your sale, the better a thought leadership web presence attracts inbound leads. Search engines value expertise because it identifies authorities in each area of business. Customers seek you out when they discover you're an authority. A magnetic content stream helps you drive traffic to your web presence, connect with customers, and become a preferred provider. The longer your sales cycles, the more a steady stream of expert content helps nurture customers through sales. Compelling content strengthens lasting bonds over time to improve customer retention. Your content stream makes it more likely customers will choose your offerings repeatedly instead of going to the competition. That's because compelling and useful content helps builds familiarity, affinity, and trust. When you configure your own system, you're not locked in to some total solution's inherent limitations. Search engines relentlessly improve algorithms, altering natural search results. Social consensus weighs ever more heavily in searches. Older SEO measures become worthless or start working against you. With your own digital publishing operation, there's no need for concern because you can change features and functions by adopting new or different web-based services at will. Conserve marketing budget while improving inbound leads and sales. Drive more traffic to your entire web presence. Build familiarity, affinity, and customer confidence continually. Engage with customers and lead conversations to sales. Use content as both attraction and reward for considering your value propositions. Nurture customers through sampling or trials, initial and repeat sales, and referrals. Increase customer satisfaction and retention over the long haul. Stimulate more referral business to build backlog and drive growth. Achieve a more stable cash flow at higher levels and exceed your business goals sooner. These days, each business must become an online publisher to fully prosper. This e-book helps you determine your content strategy, set up a working tactical system, and generate and deploy content marketing without under-buying or over-spending. In the following pages, you'll learn to create a content marketing engine that includes what you need, leaves out what you don't want, supports safe e-publishing, and minimizes your effort to market well. From early 1986 through the end of 1991, my lifelong friend Nancy and I enjoyed ocean sport fishing from a diesel trawler out of San Diego, CA. We had many adventures with Tin Hau, a historic vessel. She was among the last of the production wooden trawlers, a Grand Banks 32 woody built by American Marine in their Singapore yard in 1966, before the fire that destroyed that facility. Tin Hau was cosmetically and structurally restored to like-new condition during the decade before we acquired her. We re-named her after the Chinese sea goddess who was depicted on her manufacturer's medallion. To us, this lovely and stalwart vessel was much more than a boat. She seemed almost alive to us. She became like a family member. The main characters of Sea Goddess include the gorgeous and talented Jess, who was inspired by my former wife and lifelong friend, Nancy, who never quite outgrew her tomboy phase and who loved fishing with her Dad as a kid, as I did. And Evan, her husband, is my alter ego, an engineer and writer with outdoorsy inclination who grew up fishing in Florida. We fished and cruised on Tin Hau extensively in the ocean around San Diego, CA, to 100 miles and more offshore. This book is a novel, a fictionalized collection of experiences that we actually lived. The story is augmented and recast as fiction and written in a contemporary, literary style. Rather than writing memoir, I saw the opportunity for a more engaging story as fiction. Some chapters recount fishing adventures and others, some precarious situations, along with many sweet joys of life afloat. I have sport fishing in my blood and clearly, so does Nancy, who out-fished all our guy friends regularly. One of my uncles was Frank O'Brien, the founder of Tycoon Tackle, a famous, old-school sportfishing tackle manufacturer. Uncle Frank was a contemporary of Hemingway and Faulkner. He was inducted into the IGFA Hall of Fame to honor his fishing and tackle-building accomplishments. Legend has it that Ernest Hemingway preferred Tycoon brand tackle for his fishing exploits. Each chapter in Sea Goddess was planned to stand alone as a short story or to be a chapter in a continuing narrative. I've even included of a few of our favorite seafood recipes because we consumed what we caught or gifted it to others who loved seafood. This book is available in Kindle format on Amazon.com. I edited Spontaneous, a men's adventure novel, and provided the synopsis below during a 4-week interactive connection with the Author. Spontaneous is a 318-page, men's adventure novel, available on Amazon.com in both paperback and Kindle editions. It was published on the CreateSpace Independent Publishing Platform on February 14, 2015. Seven reader reviews have achieved a 4.6-star average rating at the time of this writing. Incompetent governments and their politicians oppress and exploit you and fellow citizens for decades. The self-serving policies blow back when radical militant factions launch waves of vicious attacks, laying waste everything your culture is, and stands for. Civilization crumbles. Streets run red with blood. Ultimate violence threatens your own family, your fortune, and all you hold sacred. Only decisive action can make any difference, yet world leaders and their minions sit paralyzed as radicals riot, militants attack neighborhoods, and massive plagues and slaughters kill billions worldwide and then nuclear war breaks out. You are Gianni Castillo and your time of reckoning is now. You head the oldest, most powerful, and wealthiest family in history. Your abilities and circumstances position you to seize power, make heart-wrenching decisions, end tides of violence and pestilence, and guide the ruined world to lasting peace, under a whole new form of government. What will you do? How will you decide who lives and who dies? How will you defeat rampant evil? How will you make Apocalypse impossible to happen ever again? Your Family and their science hold the key. This is that story, unfolding as you hold the very fate of mankind in your hands. . .
"I have found it rare, in my life, to encounter professionals that under promise and over deliver. Joseph Riden is one such individual. I wrote a series of articles on fishing adventures, which were good but needed some serious word smithing. I found Joseph, with some effort, and he turned my work that was ordinary into extraordinary prose. A year later I had completed my first novel, some three hundred pages in length and turned to Joseph for editing and to make it flow. He did a remarkable job, on time and on budget. While not a best seller I get royalty checks every month . . ."
A psychic’s prediction haunts a young girl, causing her confusion and fear. Having a limited time to fulfill his dream, her childhood sweetheart makes her a promise before his death.Tragedy continues and she must make a decision to abscond for the safety of her children. Leaving her hometown in a borrowed car, adversity continues to follow her. She must deal with memories of a difficult childhood, and a heart that has been shattered. A man enters her life and offers her the life she so desires. Upon his death she becomes aware their entire twenty years of marriage was full of lies and deception, as his government ties are revealed to her through an unexpected source. Illness, and more deception continue until a chance encounter with a foreign speaking man who hides his own sorrows, finally teaches her to forgive and feel love. With His promise forever unbroken, she finds safety and guidance with the continuous apport* of love, his yellow roses. *Apport is a term that means: (verb) the paranormal transference or rendering of an object; or (noun) an object that is transported or produced by paranormal means. "I would like to take a minute to THANK YOU, FROM THE BOTTOM OF MY HEART. During the entire process of editing, you never lost sight of the fact that the book is my story and in every manner you respected that. You did not try to change my way of writing, you only enhanced it. You were so kind and willing to help that you made the entire process enjoyable. It was a pleasure working with you and learning from you. You are a gentleman and a true scholar. The editing you did on my book was purely stellar." "The Marlin" is a memoir story of about 3,800 words set in the mid-1980's. Some names were changed but all the rest is completely factual. It's about a couple in their thirties who loved to fish and cruise in the Pacific Ocean on their Grand Banks, a classic, thirty-two-foot, trawler-style, wooden yacht. They lived in Southern California, where surrounding waters of the blue Pacific offered them great satisfaction in their leisure interests. They would fish year-round and enjoy cruising to surrounding, offshore islands. As the summer months unfurled each year, Evan and Jess spent most of their time on their boat, Tin Hau, fishing and cruising the coastal region near San Diego, when they weren't working their jobs or doing maintenance that the boat required. On the particular day of this story, they encountered an astonishing surprise; one that challenged them to the limit but would prove quite rewarding if they could prevail with Fate's summons. Odds were against them all the way. This is the story of how that day unfurled as they took the challenge, stood up to the difficulties and dangers, and fought to win with all the strength and wit they could muster. It was high adventure on the high seas. This story was originally published solo but then repurposed and altered as the first chapter in Sea Goddess. Read the original story now to find out how it went and how it turned out, given all the problems they faced. Available on Amazon.com as a Kindle ebook HERE. “This is a creative non-fiction piece written as a short story about a couple on a wooden trawler boat, Tin Hau, in the Pacific Ocean. In terms of style, pace, and format, the piece is written as a classic short story. Any story about ocean fishing and marlins will invariably invite parallels and comparisons to Hemingway's classic, "The Old Man and the Sea." This story compares very favorably to Hemingway's novel. The prose is crisp and sharp, making for a deceptively quick read, and the dialogue and characters are well-crafted, particularly for a short story. The prose is descriptive without ever turning purple; the characters stay true in their introspection and thoughts about what occurs during the story. Recommended to fans of excellent creative non-fiction; those who enjoyed "The Old Man and the Sea;" anyone looking to spend time with an excellent short story which features crisp prose, solid characters, and good dialogue. "The Prodigy" is a fiction story of about 7,500 words. It's set in the mid-1950s, postwar era. It's the story of a young boy named Jordy who faced frustrating challenges, especially at school, because he was gifted with "prodigious" intelligence and intense curiosity. These qualities often made Jordy feel, look, and act differently from other kids. That attracted unwanted attention, sometimes in ways that caused trouble, when all he really wanted to do was learn about, read, and write about all the things he found fascinating in the world. Along the way, he faced physical danger, temptations, difficult people, helpful people, and some satisfaction. But how would he find his rightful place in the world? Read the story now to follow Jordy's adventures and discover how it all went. Available on Amazon.com as a Kindle ebook HERE. The Rocket is a fiction story of about 3,800 words. It's about a middle-school lad named Harley who was frustrated about his family situation. The story takes place in the late 1950's in the US Deep South. Harley never got the time and attention that he longed for from his Father. His younger brother looked a lot like his Dad. This annoyed Harley because he wanted to be just like his Father but he knew he never could. The two boys and their Mom lived a comfortable life in a pleasant place, and they all had everything they needed and a lot that they wanted. But Harley suffered discontent continually, until the day when he started making progress with his new project, a model rocket inspired by the launch of Sputnik One, the first earth satellite, launched by the Russians in 1957. Harley's space-crazy project progressed until he started testing his rocket fuel, then things got complicated. Read the story now to find out how things progressed and how they eventually turned out. It's available on Amazon as a Kindle ebook, HERE.